Spiked Crockpot White Hot Chocolate is made in the slow cooker with white chocolate, milk, and coffee creamer. Then it’s SPIKED to make the perfect winter cocktail recipe. Birthday cake, amaretto, peppermint, rum, and more ideas for flavors! By the way, the Amaretto one is OFF THE HOOK amazing. It was all I could do not to gulp the whole thing down! Nope, your crockpot isn’t just for stew anymore: I love making breakfast, cake, and hot chocolate in my slow cooker. Now I’m adding WHITE hot chocolate to that list. Honestly, I wasn’t sure what to call this post. Hot White Chocolate? Hot White Vanilla? White Hot Vanilla? I settled on Crockpot White Hot Chocolate because google told me that’s what people search, but this is a very vanilla, very delicious hot drink. I used white chocolate, so I guess it fits, although hot chocolate reminds me of drinking chocolate, not drinking vanilla. This hot drink is the perfect crockpot recipe for winter. It’s great for a holiday party or New Year’s, but it’s also perfect for the cold months of January and February. It’ll warm you right up as you sip it, especially if you add some liqueur to it. It warms you up from the inside out! If you’ve never made crockpot hot chocolate, you must try it. It’s fast and easy and way better than that powdered stuff. This white hot chocolate recipe is very vanilla in flavor, and it only has 4 ingredients! Pour, stir, slow cook, done. The recipes for a basic white hot chocolate you find online use milk, white chocolate chips, and vanilla. I decided to add in one of my favorite add-ins: coffee creamer. Specifically, International Delight Sweet Cream. That’s my favorite flavor of all of them and one I use every day, so I always have it in my fridge. Using that with milk gives it an ice cream-like flavor on top of the white chocolate. Plain, it was fantastic. But when you add alcohol? EVEN BETTER! The options for liqueurs are endless. I have so many ideas for what to mix with this drink. The thing is, with normal hot chocolate you’re kind of limited. I mean, you’re not going to add triple sec or limoncello to chocolate…but white chocolate? Anything goes! I chose four different ones, but I couldn’t gone nuts in my liquor cabinet adding flavors to this drink. Spiked Crockpot White Hot Chocolate is the perfect winter drink recipe to warm you up from the inside out! It looks like milk…but it’s so much more than that! Creamer – use your favorite flavor! There are so many to choose from in the International Delight aisle. Vanilla extract – use pure or even vanilla bean paste to pump up the flavor. Mix them all, set it and forget it. 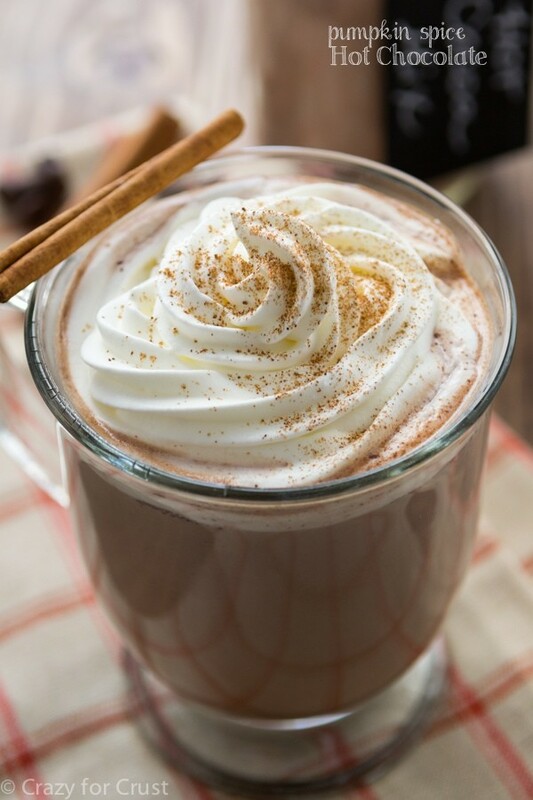 After 1 1/2 to 2 hours on low, you have the perfect vanilla hot chocolate recipe! Add liqueur – because why not? 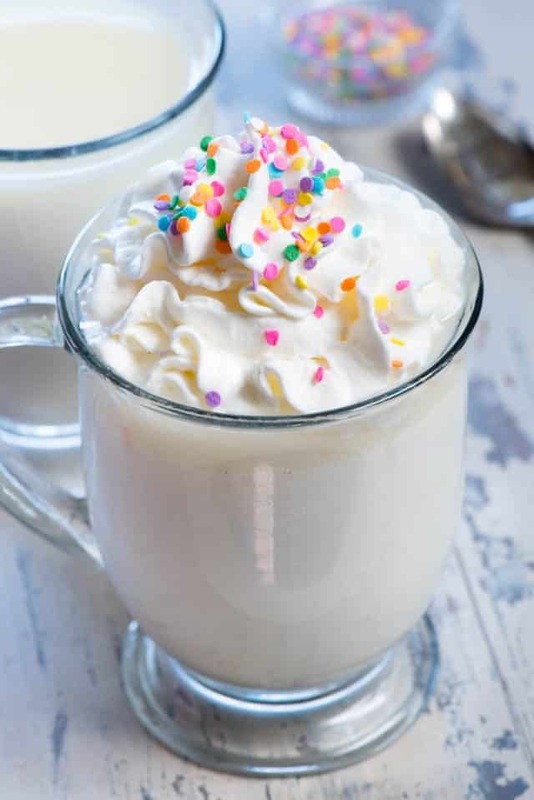 The first photo in the post is what I’m calling Birthday Cake White Hot Chocolate: I added a hefty dose of cake vodka and sprinkles on top! You could also use vanilla vodka or any of the fun flavors they have now (caramel, whipped, etc.). I also decided to add Coconut Rum to one of them. You guys. Fantastic!! The combination of the vanilla and the coconut and rum flavors was spot on. Hands down, my favorite was the Amaretto White Hot Chocolate. I love amaretto; the smell is intoxicating. I could have just sat around all day and drank this…too bad I had to go to school pick-up, ha! And then, of course, the holiday flavor: peppermint. 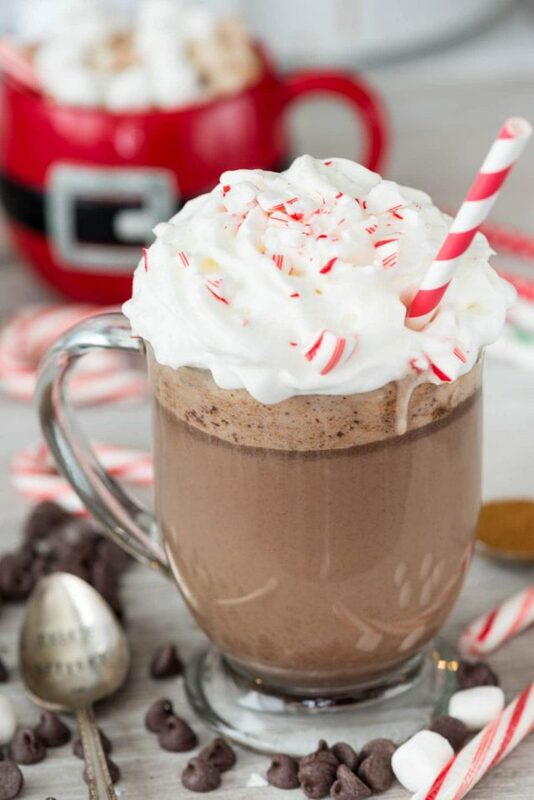 Peppermint Schnapps goes with white and dark chocolate, so I knew making a Peppermint White Hot Chocolate (aka Santa’s Favorite Cocktail) would be perfection, and it was. Just hand me a straw! Again, you can use ANY liquor flavor and ANY coffee creamer. The combinations are endless. Unfortunately my tolerance isn’t endless, ha! Spiked Crockpot White Hot Chocolate is made in the slow cooker with white chocolate, milk, and coffee creamer. Then it's SPIKED to make the perfect winter cocktail recipe. Birthday cake, amaretto, peppermint, rum, and more ideas - the flavors are endless! 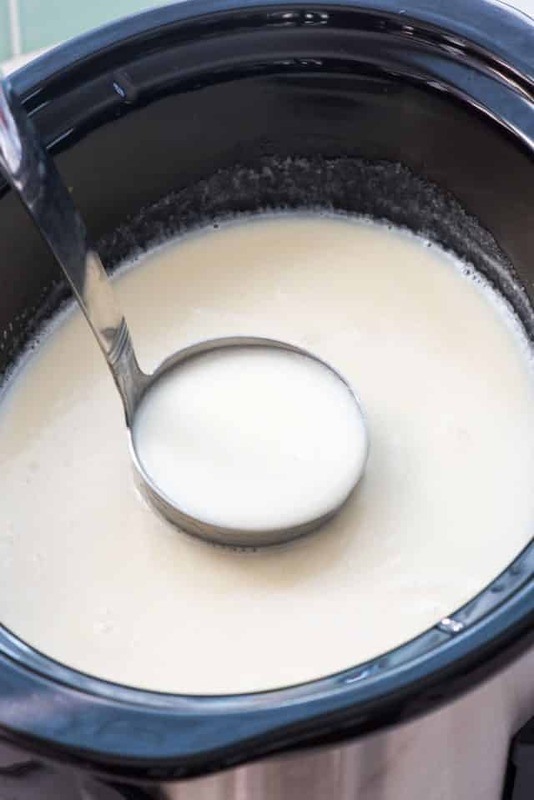 Mix white chocolate, milk, coffee creamer, and vanilla in a 5-6 quart slow cooker. Cover and cook on low for 2 hours, or until hot and white chocolate is melted. 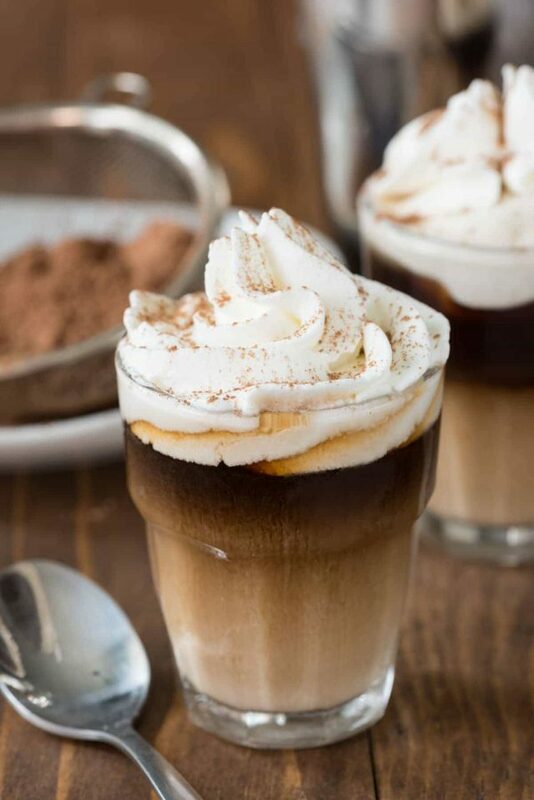 Serve warm with whipped cream and garnish. 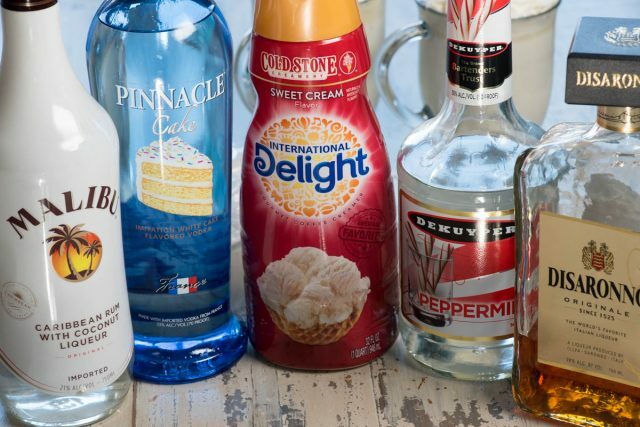 For Birthday Cake White Hot Chocolate: add 1 ounce cake flavored vodka and sprinkles for garnish. 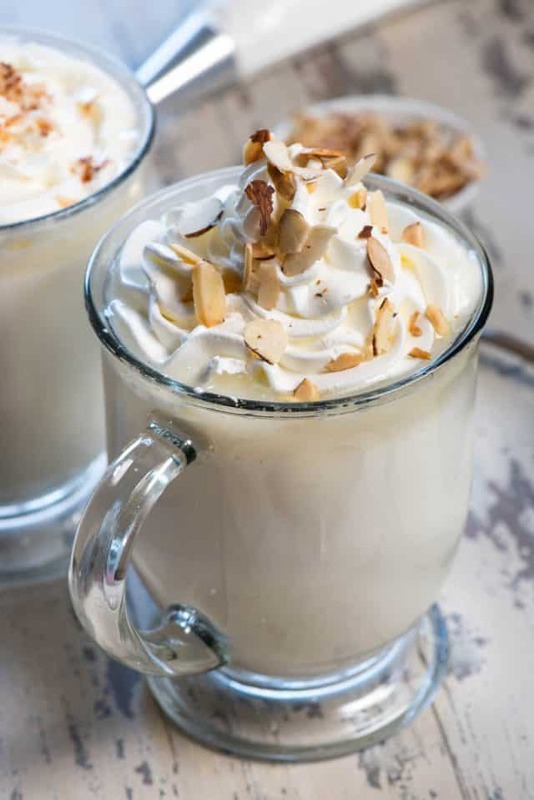 For Almond White Hot Chocolate: add 1 ounce amaretto and toasted sliced almonds for garnish. 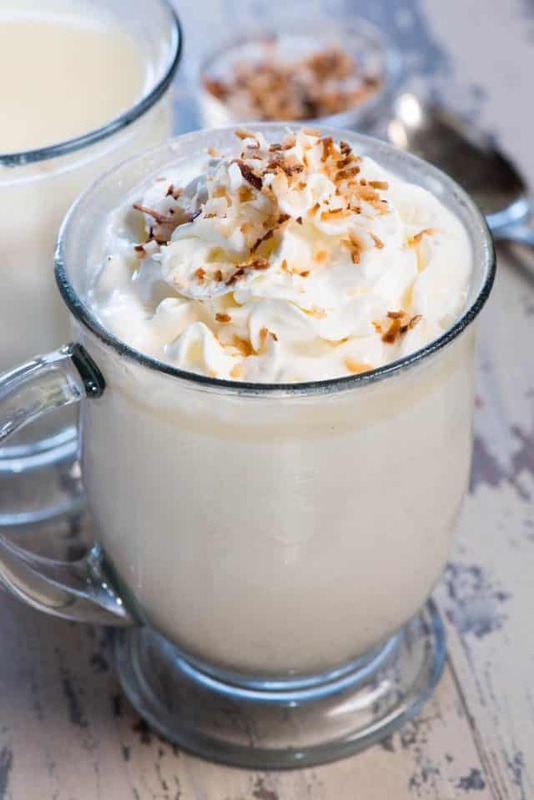 For Coconut White Hot Chocolate: add 1 ounce coconut rum and toasted coconut for garnish. 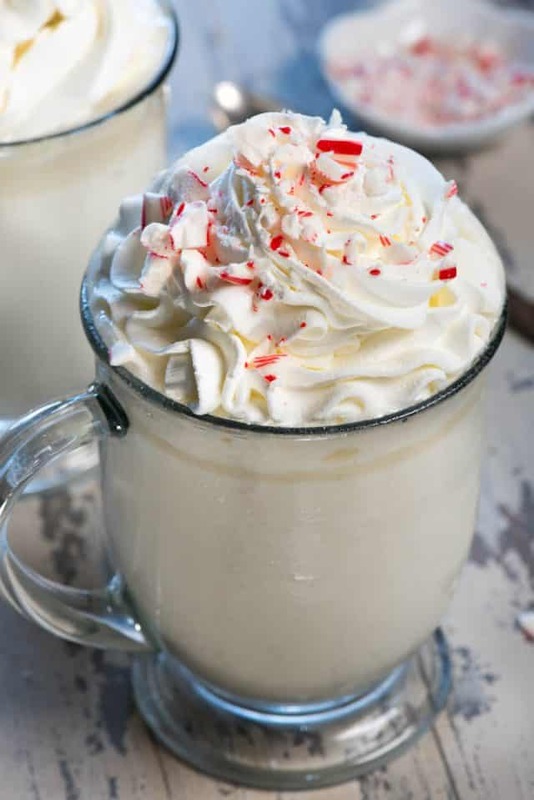 For Candy Cane White Hot Chocolate: add 1 ounce peppermint schnapps and crushed candy canes for garnish. Click here to see more of my drink recipes! 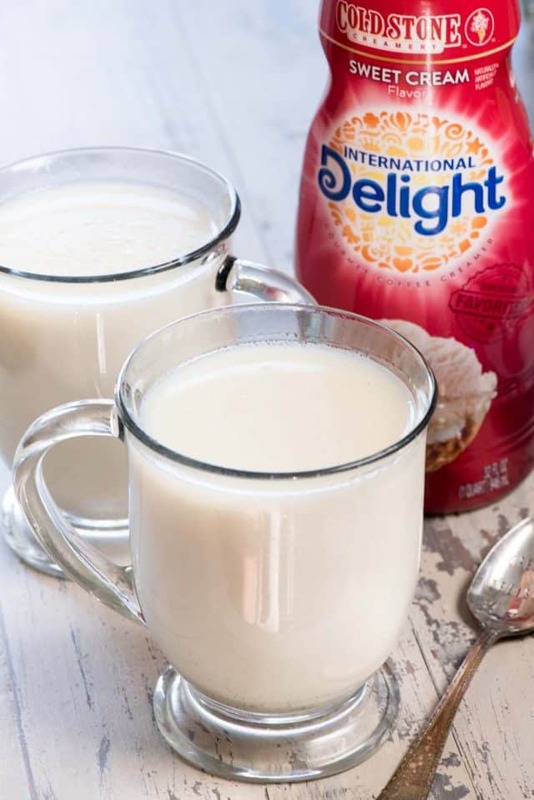 Connect with International Delight on Instagram, Twitter, and Facebook. And this white hot chocolate would be something I could drink every day! I love amaretto too…swoon!